As the story begins, the Alfred Pennyworth of Earth-3 narrates a summary not just in the Trinity War but events since the start of the Justice League series. While the JL was battling Darkseid, Alfred-3 escaped his world through the weakened barriers, accompanied by Atom. And while the JL was occuppied fighting normal threats, Alfred-3 was working to bring his master to this earth from Earth-3. The three JLs, however, are busy fighting over Pandora's box, thanks to the evil leaking out of it. They battle each other in a superhero verison of the old schoolyard game "kill the guy with the ball", until they finally stop as they realize that the box is affecting everyone else mentally but Superman is being affected physically. Firestorm concludes that there is Kryptonite inside him, and Atom admits that she put it there, inside his brain -- because she is not with the JL, but secretly with the people of Earth-3. Cyborg's robot parts betray him at this point, and tear themselves away from him to become "Grid," a walking virus. In the confusion, Alfred-3 grabs the box, which he reveals is from Earth-3, the "birthplace of evil," and the box acts as a portal. He uses it to gate his allies, the "Crime Syndicate" (an evil anti-Justice League from Earth-3) to our world. Thus the "Trinity War" (Trinity for "Earth 3") ends and the Forever Evil story begins. This story had its strong and its weak points. On the strong side, some of the events that have made no sense to the reader for upwards of two years are finally explained, so now we understand why certain things happened. Additionally, the narration by Alfred-3 was fairly well written. On the other hand, we still have too many contrivances in this plot -- too many of the events still seem to have happened "just because" (i.e., because the writers wanted them to happen, rather than the events following logically from a consistently woven story). As a great example, how did Alfred-3 and "Atomica" get through to our world from Earth-3? All we are told is that the "barriers between universes were weakened." Does this mean that Darkseid's attack generally weakened the barriers between all universes? And if that's the case, then why did only two people each from Earth-2 (Huntress/Powergirl as shown in Earth-2 #1) and two from Earth-3, cross barriers? Nobody else did, from any universe? This requires better explanation. Right now it is just hand-waving. Also on the negative side was the effect of the box on the characters. The problem is not that the box can turn people evil, but that the way the effects manifest are comical rather than dramatic. 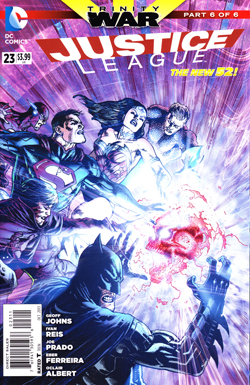 For example, Superman, green from Kryptonite and eyes a-glowing, starts to accuse Wonder Woman and Batman of having a fling, and then suddenly there is a two-page spread where Superman yells out "I won't stop until Batman is dead!" I confess I actually laughed at this double-page spread. That line of dialogue is like something I would have written when I was doing my own comics at age 10. It's juvenile. And too many of the lines spoken by the folks "turning evil from the box" are just as silly. Probably the worst element of this issue is the over-reliance on "shocker" full page (and double page) spreads. There are eight -- count them, eight -- in this book. It's so over the top that, again, it's comical. Rather than providing a solid story, Johns and Reis rely on one shock-scene after another. Shocker -- everyone's possessed by the box and trying to kill Constantine! Shocker -- the various Leagues are fighting and Superman tries to kill Green Lantern! Shocker -- Superman won't stop until Batman is dead! Shocker -- Cyborg's body is ripping apart! Shocker -- Cyborg's metal half is a new villain! Shocker -- One-handed Aquaman clone appears and dies instantly! Shocker -- evil versions of the League appear! Shocker -- the Crime Syndicate is on the loose! What little story this book has, is squeezed in between these comically exaggerated "shocker" scenes. Rather than drawing what is going on, Reis draws these characters in ways that look like they are posing for the camera, and the whole thing comes off seeming forced. The whole issue is designed to elicit "Holy cow!" (or something more graphic) from the reader with the turn of every single page, which oversaturates the story with "shock and awe" scenes, thereby robbing each individual scene of any power it might have had. The result is a bunch of pinups with a little bit of story squeezed in around them. The fact that what story is there, is not too bad, is the only reason I didn't give this book a lower rating. The artwork by Reis continues to be a mixed bag. He draws bodies and backgrounds extremely well, but he also tends to draw the wrong things. As I said above, the characters look like they are posing for a picture rather than engaged in any action. In a rather strange way, Reis seems to draw the parts of the action that would not normally be drawn, and leave out the parts that usually would be depicted. The result is a very disjointed feel, with abrupt and jarring transitions from scene to scene rather than a smooth flow. The story in this issue could have been pretty good, if the team had executed it better. Unfortunately, they are clearly playing for the pure shock value, rather than for a solid story, and the whole thing struggles to stand up under the weight of all the full and 2-page spreads. This is a great example of why the wise understand that "less is more." The best thing I can say about the issue is that at least the Trinity War is over, since I haven't really liked it, and at least Johns finally explained a few things. Unfortunately, I have absolutely no faith in DC's ability to deliver quality from Forever Evil at this point, and I fully expect it to be issue after issue of "shock and awe." Which means they can count me out. I will probably pick up JL 24 and 25 and see how they are, but if something doesn't change for the better quickly in this series, it's going the way of its little brother (JLA) and getting yanked from my pull list.